Gluten-Free Oats. Some people can tolerate them, other people have a war in their tummy after eating them. For the most part, I stay away. However, sometimes I need an oatmeal cookie. The stomach/brain wants what it wants. 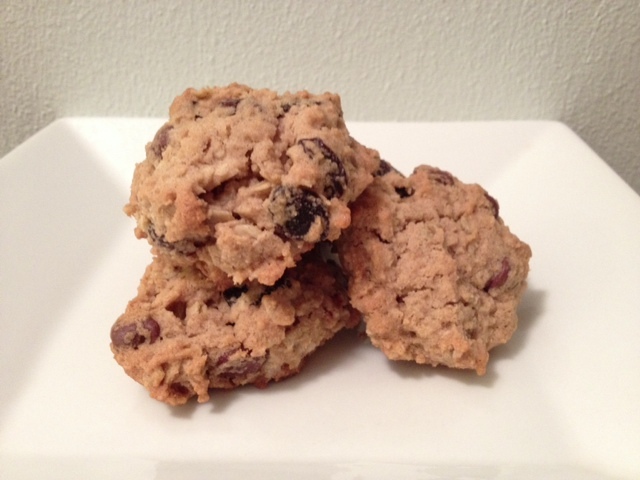 This recipe is very similar to the chocolate chip cookie recipe I posted last week. With your handheld mixer (or stand mixer if you’ve got it handy!) beat your butter and sugars together. Scrape yo’ bowl. Add your applesauce and vanilla until they are combined. Scrape your bowl down and dump in all of your dry ingredients (NOT your oats, chips, or raisins though). Turn that mixer on again, and get to work. Make sure everything gets incorporated. I won’t judge if you try a spoon full. Finally, stir in your chocolate chips, raisins, and oats. Scoop small mounds of your cookie dough onto your pan, leave about 2 inches between each ball. Press them down lightly and put them in your oven. After 12 minutes check on them. They should be slightly golden. Take them out and let them cool. I leave mine on the pan until they’re cool and just eat them off the pan. 😉 You can transfer yours to a container if you have self-control and will eat them over a span of 2 days. Mine don’t even last until after breakfast. I. Just. Can’t. Help. It. PPS: Remember if you are making these with the intent of serving them to a vegan- use vegan sugar! Not all sugar is vegan! Sorry I’m such a posting delinquent. I have no excuses. The husband and I were sitting around the other day, oogling photos and videos on Instagram…. He came up with the brilliant idea to turn recipes into 15 second videos. 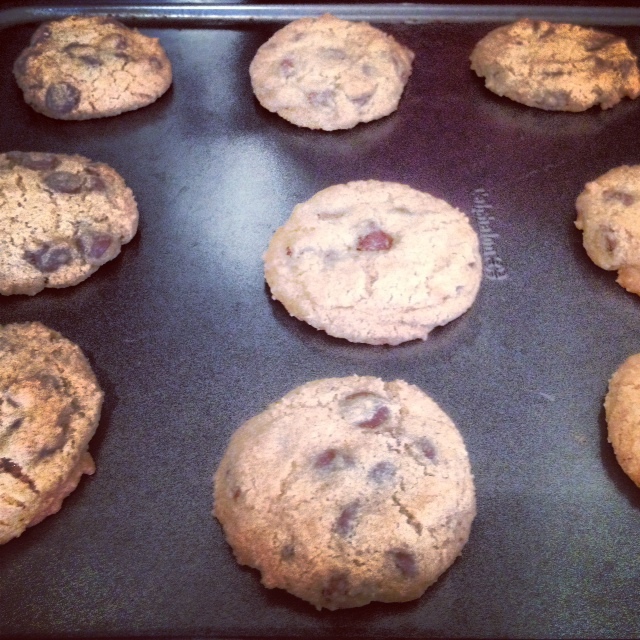 I attempted it today with my favorite chocolate chip cookie recipe. It is vegan and gluten free (make sure to use vegan sugar and chocolate chips if you’re a vegan- obviously I probably didn’t need to tell you that). I can’t do dairy or eggs but am not vegan, so I used normal sugar. Beat together your butter and sugars until creamy. Add your applesauce and vanilla and beat until combined. Scrape your bowl down and dump in all of your dry ingredients. (NOTE: I’m lazy. If you would like to mix all your dry ingredients together in a separate bowl first, go for it!) Beat everything together, scraping everything in. Next, stir in your chocolate chips. Using a spoon or a small ice cream scooper, scoop the cookie dough onto your baking pan. I used a nonstick pan, but you can also use parchment paper. Press the cookie dough balls down slightly. My friend’s daughter turned one last week. 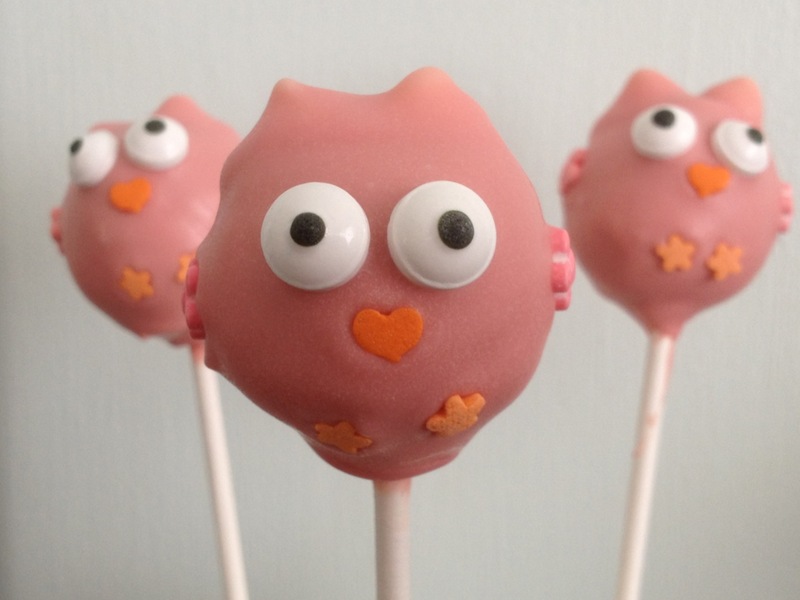 She asked me to make owl cake pops for a pull-apart cake she was having. The whole idea is really adorable…. Thank you Pinterest! I made the cake pops, so they are obviously gluten free. 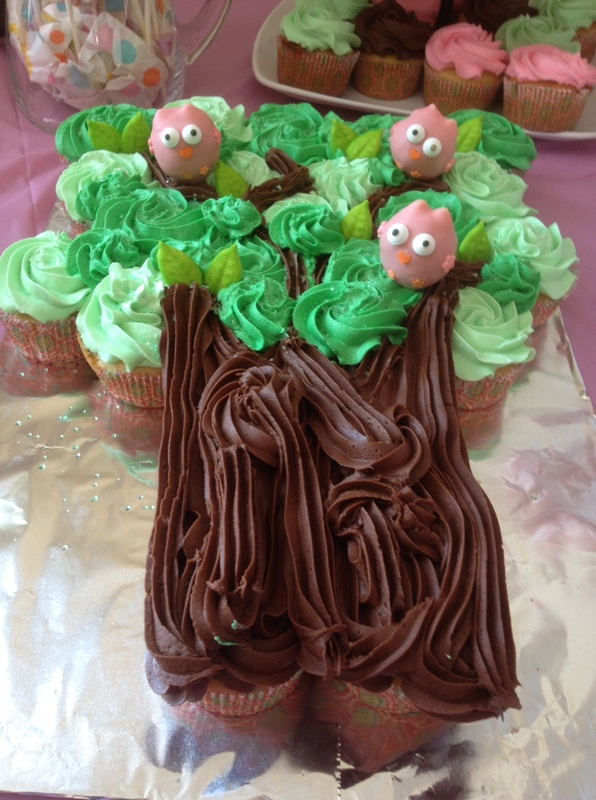 The smash cake and the pull-apart tree are not (but could easily be). 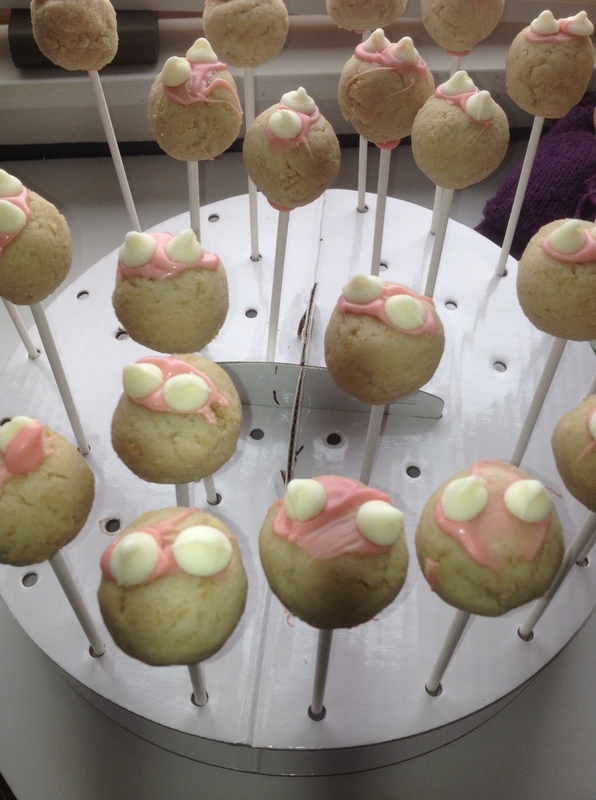 If you’ve never made cake pops, they are fairly easy. I always use a gluten free boxed cake and store bought frosting. They work better. My cake recipes are too moist and don’t crumble as well. I always use one of the plain vanilla jars of frosting (the ones that are gluten free). I used the Hodgson Mill vanilla cake and followed the recipe on the back. Let the cake cool completely and crumble it in a giant bowl w ith your fingers. There shouldn’t be any huge chunks left. 2. Add frosting Start by only adding half of the can of frosting. You can always add more if you need to, but if you add too much… you’re kinda in trouble. I always use my hands to mix everything together. You can use a spatula if you want. The cake/frosting mix needs to be able to be rolled into balls without falling apart. However, they should not be mushy! I think I ended up using a little less than 3/4 of the can. Wash your hands and dry them off for some ball rollin’! Using a 1 TBSPN scooper, scoop up some of the cake/frosting mixture. Using your palms, roll the mixture into a ball. Put the balls onto a parchment covered cookie sheet. Continue until all of the balls are made. Make room in your freezer! Pop the cake balls into your freezer for 5-10 minutes. While they’re in there, start step 5. In a deep, microwavable mug put some of your white chocolate candy wafers. Microwave the chocolates according to the package instructions. 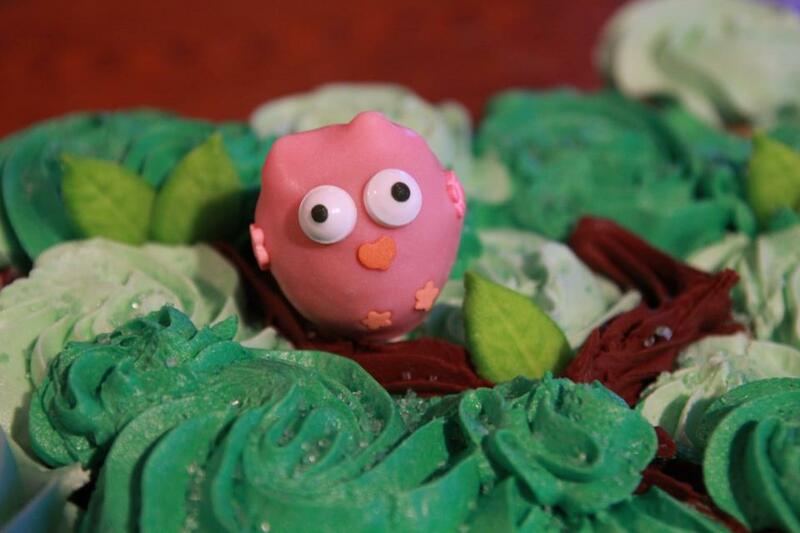 I used pink because my owls were going to be pink. Use the same color that your owls will be dipped in. After your balls have hardened a tiny bit pull them out. Dip one end of your cake pop stick into the melted coating chocolate and push the stick about 2/3 of the way down into the center of the cake ball. Repeat until they’re all done. Put them back into the freezer for about 20 minutes. 6. Add White Chocolate Ears Make sure your chocolate is melted (pop it back into the microwave). Either invest in a cake pop stand or you’ll have to make one out of either a Styrofoam block or shoe box. You will need a place for your cake pops to stand so they dry. Put your hardened cake pops into the stand. Then put a little bit of the melted chocolate onto the top (where an owl’s ears would be). Put two chocolate chips at the top of the cake pop, on the melted chocolate… Your chocolate is acting like glue. Once you’ve done all of them, put them back into the freezer for 15 minutes. You will need all of your candy pieces ready because you have to work quickly. I used pink flowers for the wings, orange stars for the feet, an orange heart for the beak, and candy eyes. Put each type of candy on shallow plate. Get your tweezers ready. Melt more chocolate candy wafers. Then, take the cake pops back out of the freezer. Carefully dip one of the cake pops into the melted chocolate. Keeping it at a 45 degree angle, tap it on the edge of the cup. You will need to twirl the cake pop as you do this to make sure everything gets covered. You’ll get the hang of it after a while. Once you have most of the excess off you need to work quickly…. Using the tweezers, put on the eyeballs. Then you can put on the beak, the feet, and the wings. Put the cake pop into the cake pop stand so it can dry. Try not to crowd it with extra cake pops, otherwise it will smudge. After about 15 minutes or so, I pop everything back into the freezer. 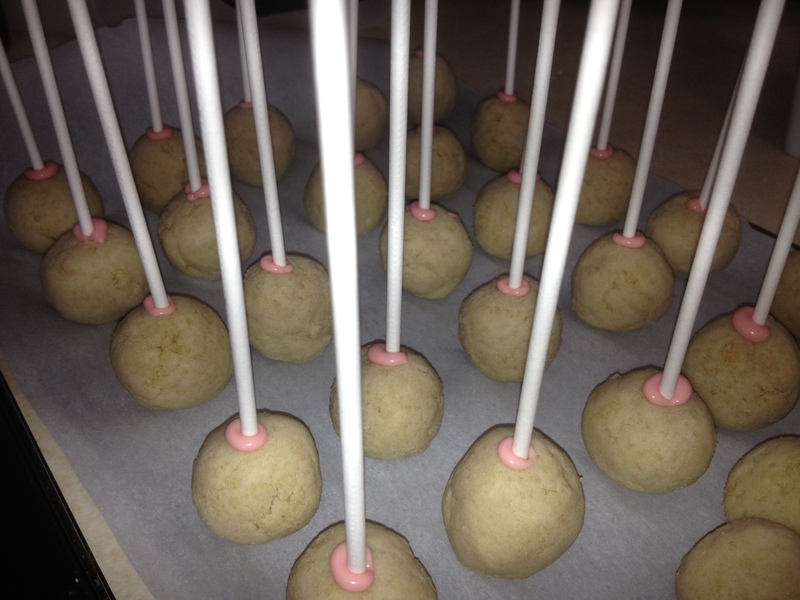 If the cake balls get warm before you dip them, they may fall off the stick. 10. Bag ’em!Once all of your cake pops have been decorated and you have put them into the freezer for about 10-15 minutes. You can put a small candy bag over them. Tie them with a twist-tie. You can put the cake pops into a jar filled with pebbles, tissue paper, or sprinkles. My friend cut the sticks down on a few cake pops and then put one in her smash cake and put a few others onto the pull-apart tree cake. Pancakes on the weekend are the best. Since going egg free I’ve tried a zillion different recipes, trying to find the perfect pancake that would satiate my weekend pancake cravings. 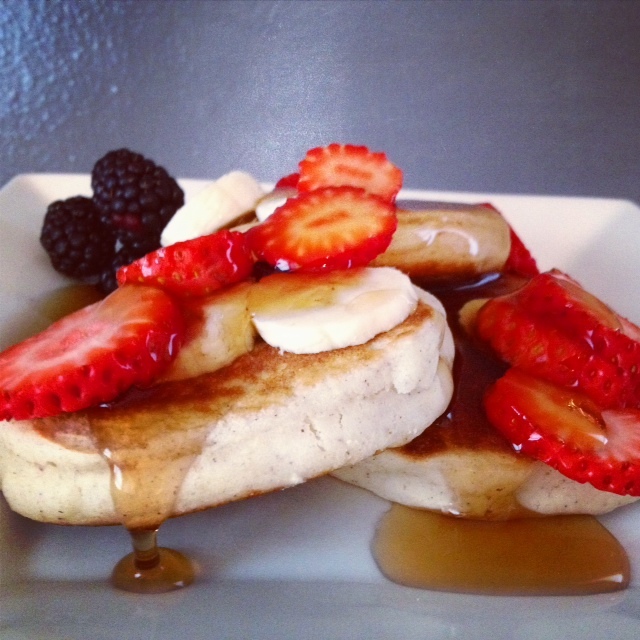 This recipe created the fluffiest, most delicious pancakes… even without eggs! If you like banana, you could substitute the applesauce below for half of a smashed banana…. And then add some walnuts! YUMMY! Whisk together your dry ingredients (asian rice flour through Stevia). Add your wet ingredients and whisk together until there are little to no lumps remaining. Let the mixture sit for a couple of minutes (it thickens up a little). Heat a non-stick skillet over medium heat. When the pan is ready, scoop about 1/4 c of the batter onto it. They will spread a little so try not to put the pancakes too close together- I used an ice cream scooper to avoid funny shaped pancakes. 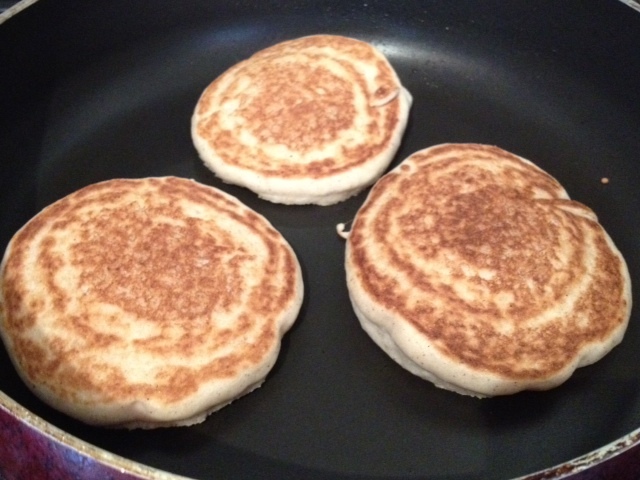 Watch the pancakes as they will bubble a little and you will notice that the edges are starting to firm up. Flip them and cook through. I didn’t time them, but I would say the whole process is about 3 minutes. Serve however you like them. Me? Berries, bananas and TONS of syrup. The husband likes chocolate chips in his. Put the chips on the wet pancakes before flipping them, just be careful not to burn that side as the chocolate chips will scorch easily.